As of last Sunday, Sunny Rebecca is officially one year old! I feel as though that this blog has come so far in this past year and hope that it will continue to grow. I originally started blogging on a whim, expecting myself not to stick with it. I've tried out a lot of things in my lifetime and tend to have trouble finding something that I like and continuously sticking with it. Throughout this year, I've learned so much about blogging as well as the blogging community and am glad to say that I'm here to stay. Bloggers tend to make everything look so effortless! I didn't realize how much effort goes into a quality blog post until I finally started blogging. The post that you see on the site is just the tip of the iceberg. There's so much more beneath it! What I think is the hardest thing about blogging is probably the pictures. I always have the perfect snap for a picture in mind, but it's not that easy. The lighting has to look right and the composition can't be too boring. In addition, I don't have anyone to help me take my pictures, so most of the time, it's just me and my tripod, making the perfect snap much more challenging than expected. On top of that, there's also post planning, photo editing, social media, writing, and more, all on top of your normal responsibilities. Blogging is something that takes a lot of commitment, but it's all worth it in the end. 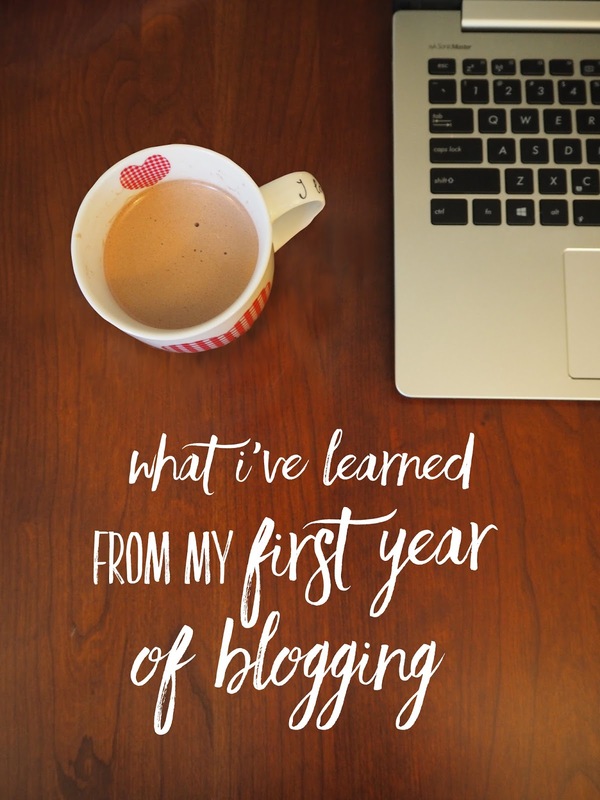 When I first started my blog, I didn't have any readers (obviously) and didn't get any until I started using social media to promote my blog. How can readers appreciate your blog if they can't find it? Social networking is a great way to get your blog out there and also learn from other bloggers in the process. Reaching out to other bloggers is 100% okay! As a shy person, it's sometimes intimidating to initiate a conversation with other bloggers. I worry that they're going to judge me or think that my blog is too amateur, but in reality, bloggers love chatting with other bloggers, no matter how established a blogger might be. Getting to know other bloggers can help you learn more about blogging and also make new friends. I've found some of my closest friends through the internet (you know who you are). Don't be afraid to drop by and send me an email and we can chat about anything your heart desires! Blogging schedules are the key to keeping organized. If you don't have a steady blogging schedule (example: every week on Fridays), then it's not only inconvenient for readers, because they don't know when to check back for a new post, but it also makes things harder on you, because posting on a whim will only end up with inconsistent blogging as well as imbalance between your blog and personal life. Knowing when you're going to post can create deadlines that you can work towards, so you know exactly what you have to get done, in addition to normal schoolwork and personal engagements. The best way for creating a blogging schedule is starting small, maybe one post per week and working off of that based on what you know you can get done. Don't bite off more than you can chew! The blogging community is the best. When I first began my blog, I wasn't really serious about it and spent most of my time not really reading many blogs. Yes, I did read a lot of blogs, but mostly the bigger and more established bloggers. However, the blogging community also has lots of smaller bloggers that have such great content that I didn't notice before. Whether you're chatting with a well known blogger or a brand new blogger, the whole blogging community is supportive and sweet all the time. If you're a blogger that has yet to reach out to the blogging community, you're missing out! The community is one of the best things about blogging. Although I've learned quite a bit throughout this first year and feel like I've come a long way, there's still so much more room for growth and potential. One thing about blogging is that you're constantly learning, whether it's about designing your blog, life discoveries, or creating quality content, bloggers truly never stop learning. This first year of blogging has definitely been amazing and I know that there's so much more in store for my blog and I. Sky is the limit for any blog. This is such a great post!! Happy one year bday! Happy one year for your lovely blog!